After a disappointing start against the Seattle Mariners Roger Clemens was in need of a MRI to check on his elbow which only lasted four innings and 62 pitches yesterday. 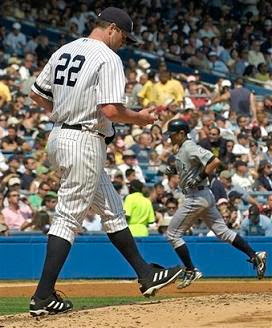 "The first three innings, it was a manageable situation for him," Joe Torre said in the NY Daily News. "The fourth inning, he said it started grabbing on him." Right now the best case scenario is the Rocket only misses one start then can come back to help the Yanks to the playoffs. Worst case scenario is that his season, and possibly the bombers, is over earlier than planned. "For safety's sake, you're probably going to skip him one time," Torre said to the Daily News. "Hopefully that's all it is." After the game Roger went to Columbia Presbyterian Medical Center to have an MRI on the elbow. The results of the test will come back today according to the NY Post. The player likely to replace Clemens even if it is only for one start is Mike Mussina who made his first relief appearance of his career yesterday. His outing was less than stellar but it was something to build on. In 3.2 innings he allowed 7 hits and 2 runs while walking none and striking out a single batter. "There is still stuff to work on but I feel better.” Mussina said in the Post. “It was fun to pitch again, but I still don't know what I am doing. If I didn't pitch today I don't know when I would pitch." Since Clemens will most likely miss at least one time around the Moose’s next start will likely be on Sunday in Kansas against the Royals. The young team should be a good matchup for Mussina who has faced them twice this season winning both games with a 2.31 ERA. Should Roger miss an extended period of time the Yanks will be forced to relay on Mussina more than they planned which could be a problem if Ian Kennedy’s first appearance was a bit of beginners luck. Should Kennedy struggle the Yankees will have to turn back to their farm-system which could mean picking somebody like Kei Igawa, Jeff Karstens, or Matt DeSalvo. Those are moves the Yanks would wish to avoid as they continue their run for the wild-card.